Isn't it a shame that we more often point out each other's mistakes, rather than the beneficial actions? 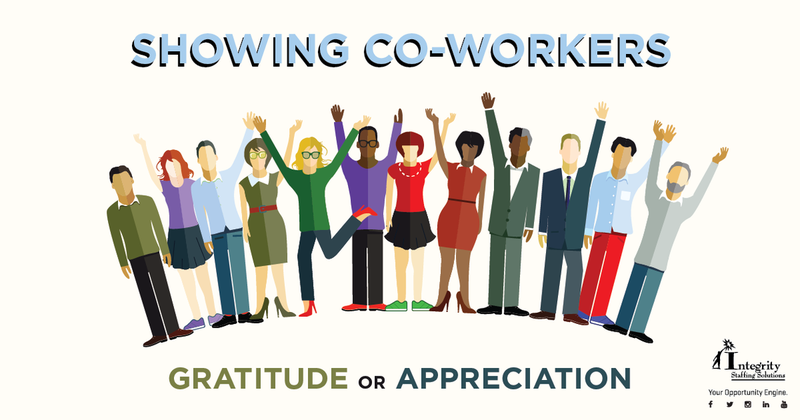 Especially when we know that doing so will harm the team's relationships and ability to enjoy our time at work. At Integrity Staffing Solutions, creating a positive, supportive culture is a fundamental principle. A happy environment is a productive environment, and one that clients want to do business with. The whole company prospers, and each team member shares in the rewards of success. Our rapid rise to the top of our industry has proven that giving each other a pat on the back can lead to great things. If you've seen someone go above and beyond to help you, a colleague or a customer, don't hesitate to let them know their effort is appreciated. Show that you don't take their help for granted. Saying "thank you" only takes one second but the boost to their morale can last all day. Speak up in the staff meeting. Call out this person's good work in front of the team and/or supervisor. Send an email or note to their boss and the HR department, explaining how their actions helped achieve the team's goals. When the help you received deserves an extra special thank you, bring them a token of your appreciation such as a box of donuts or a gift certificate. Let them know that you'll lend a hand if they get swamped. Or offer to teach them a new skill, such as using the office software. Utilize the company reward programs. If your employer already has a process in place for recognizing outstanding work, submit your co-worker's name. At Integrity, we have our own social media website, The Cube, especially for team members to post acknowledgements each other's efforts and have them seen across our nationwide network of offices. Yeah, it's that easy to show appreciation, if we just remember to do it. And imagine the chain reaction you could be starting. When people see one team member getting recognition, they'll step up their own game to be recognized as well. Result: everyone exceeds their own expectations!